The jipi japa, iraca palm, toquilla palm or the Carludovica Palmata, as it was baptized by the botanical expeditions that came from Madrid in 1798, whose objective was to catalogue all the impressive discoveries that were being made in the new world. Actually, it is not a palm, although it is a distant cousin of these, with whom it shares the same order, they are Espatifloras. Being precise, it is a herbaceous that can reach without problem 2.5 meters high and was already widely known by the pre-columbian peoples who inhabited the coasts of America, from Mexico to Chile. They used it to manufacture hats, baskets, roofs and other items used in everyday life. The toquilla grows wild, but today it is common to find toquillales with a good technology level in many coastal areas of Ecuador. For the manufacture of the fine toquilla straw hats, only the tender stems that have not yet matured are used, which are processed in an artisan way to obtain soft, flexible and very resistant fibers. 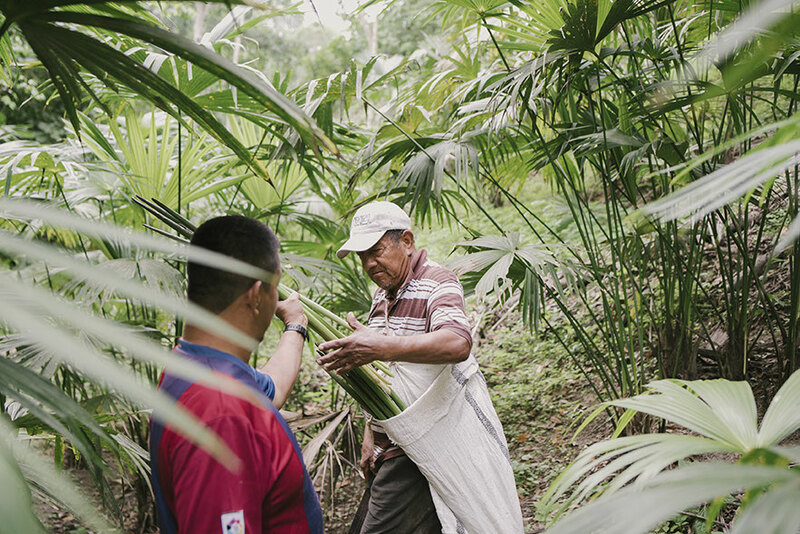 Harvesting of the toquilla palm. Domingo Carranza and his father work on their favorite toquillal. The day Domingo Carranza indicates in the calendar as the ideal day to collect the raw material, which keeps the family workshop alive, must be preceded by a few rainy days or at least with high humidity conditions, with the aim that the buds collected are green and flexible so that they do not break during transport. Domingo Carranza's favorite toquillal, is a three hour walk from his home, along a bridle path, impossible for any motor vehicle. He usually gets up very early with his son Javier Carranza, who diligently prepares the ropes, machetes and boots. In the meantime, Doña Mary, like every morning, rushes the burners of her new stove so that her men left with a full stomach. When they arrive at the toquillal, after a meticulous inspection, the stems that are going to be harvested are chosen, the health of the forest in general is checked, and with clean cuts of the machete the green stems are collected. Once at home, the buds are taken, cleaned and an exhaustive quality control is carried out to remove those that are beaten, marked or broken. Then, they are tapped softly and firmly so that the stem ribbons are separated from each other. They are then re-classified by colour, quality and softness. 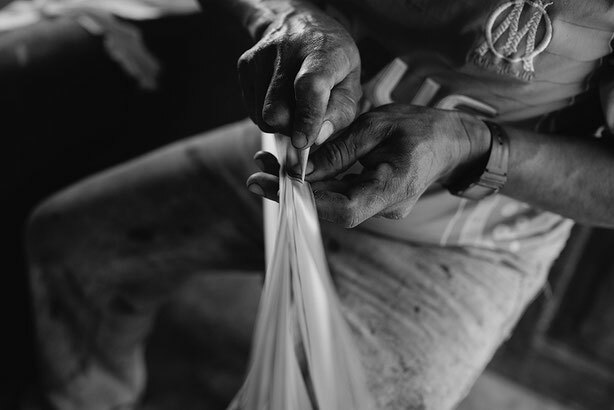 Finally, with the tip of a deer's horn is made the tearing that consists in separating the heart into even finer fibers. 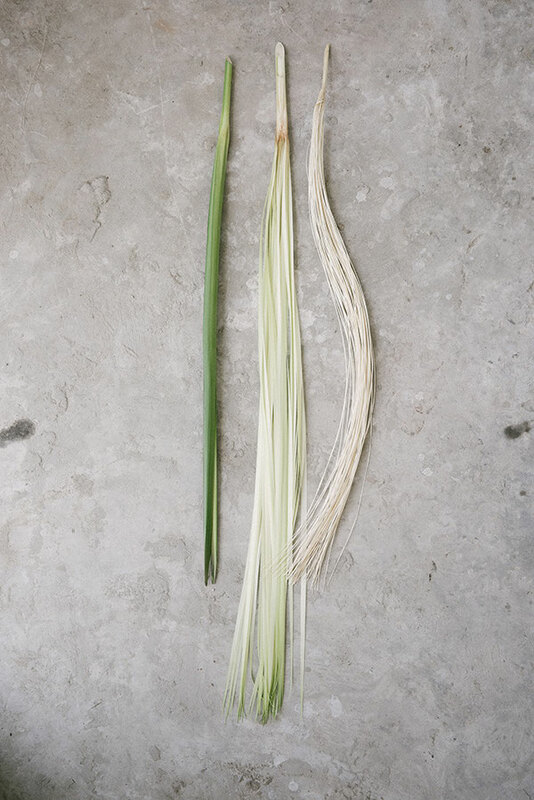 At the end of the process, the appearance of this is more like a plume of fibers than the green reeds that arrived on the backs of the artisans. 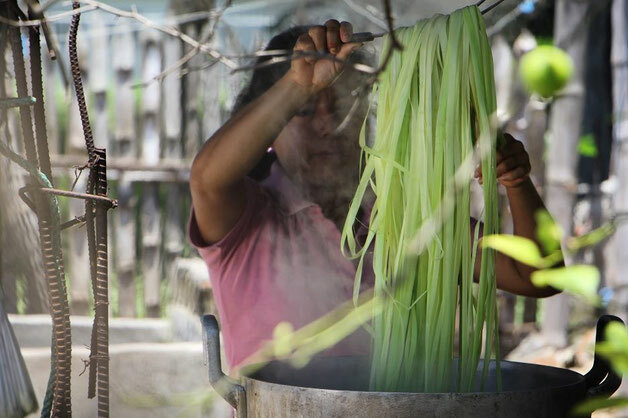 While the men tie the bundles of straw so that they do not become entangled during cooking, Doña Mary and her daughters prepare a large pot in the wood-burning stove, where they are introduced when the water is boiling. After a few seconds, the bunches are removed, untied and shaken to remove the excess water. 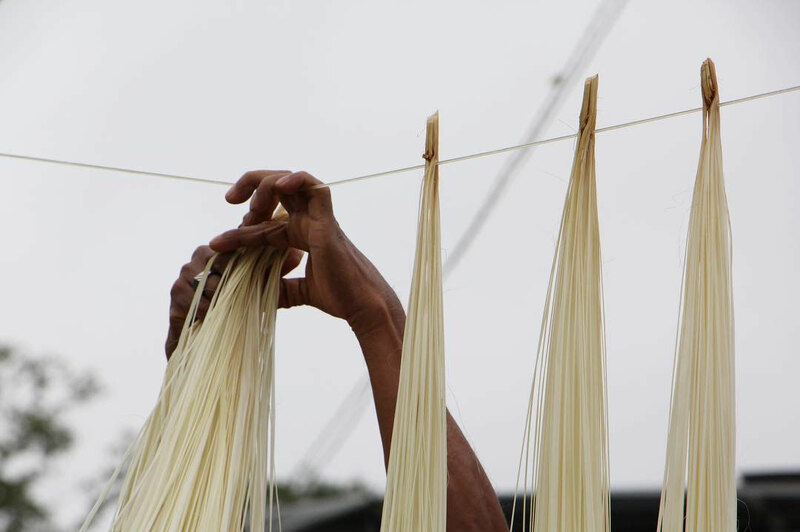 Finally, they are hung outdoors so that the moon can finish drying them, a process that helps to fix the tone of the straw. Straw that comes out of the oven is spread out and hung to dry out exposed to the moon and the elements. The buds are hung inside the primitive oven of the house. Some embers of red hot coal are introduced, which are covered with sulfur, which generates vapors that impregnate the straw to whiten it, as well as soften it. After a few hours, it is removed and hung again to expose it to the moonlight, as many nights as Domingo Carranza's experience determines to be correct. 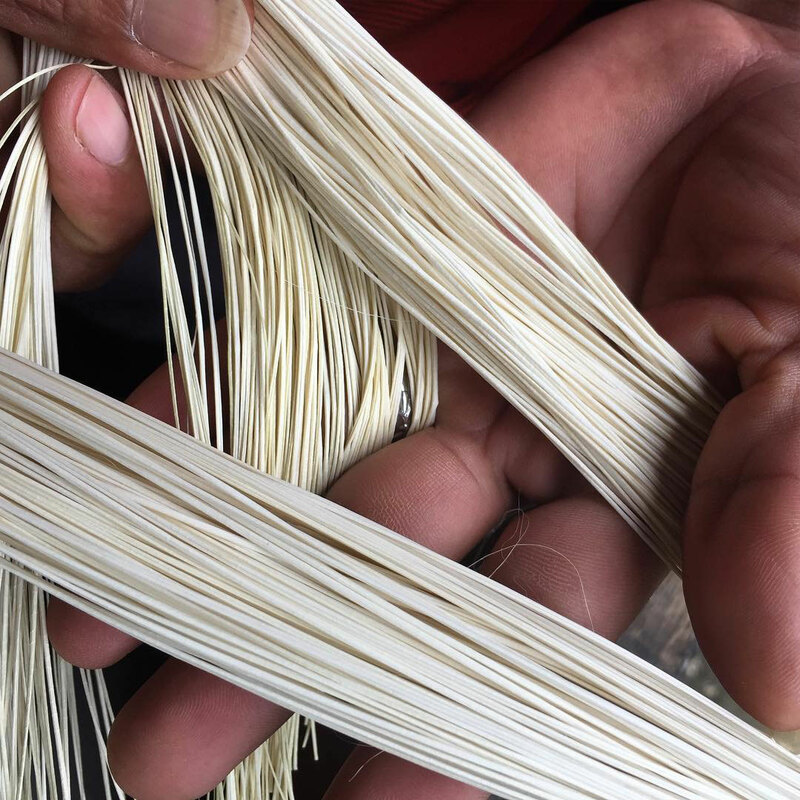 At this point, two weeks of toquilla palm processing may have passed and it is only from this point that we have the straw ready as a viable material to weave a fine toquilla straw hat. Toquilla straw ready to start weaving a fine Panama hat.